Portville, N.Y. We are co-located with the Chestnut Hill Cemetery Association. Our office is open Thursdays from 10am to 4pm from May to September. 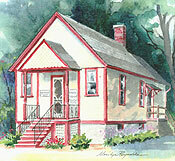 And Restoration of the Bedford Corner Historic District and Schoolhouse that was built in 1864. Many research aids for the student, historian and genealogist. Genealogies of many Portville families, Census indices, cemetery listings, county histories, and over 2,500 obituaries are on file. Hundred's of individual files and pamphlets which include Portville churches, industries, merchants, organizations, cemeteries, canal, schools, veterans, government, houses, buildings and transportation. Collecting, preserving, displaying and copying photographs, glass negatives and tintypes depicting people, places and events in Portville's past and recent history. Albums of photographs of Portville's families, Westons Mills, Flood of 1972, original Portville postcards etc. Collection, accessioning and copying of printed materials regarding Portville's history. Albums of Portville School memorabilia beginning in 1874 plus photos and minute books of district schools, diaries, scrapbooks, and maps. There are several publications for sale including books, prints and sketches.